The “Shakhe” complex is located on 4 hectares in a Soloh-aul settlement, in the beautiful foothills of the Caucasus Mountains, in Shakhe upper river. 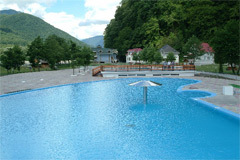 The complex is located approximately 1 – 1.5 hours from the centre of Sochi . The Caucasian State Biosphere lends to the uniqueness of the location. Various tourist routes and pathways leads to the mountains of the Western Caucasus, to ancient dolmens, to sites of the Great Patriotic War battles, to the caves, waterfalls and the fast mountain rivers. 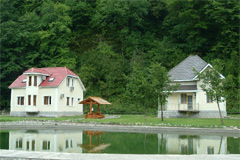 Pure mountain air and crystal-clear river waters are the main characteristics of the location of the complex. There are two trout ponds and a fine platform for mini-golf with 27 holes on the territory of the complex. A real Russian bath with a splendid swimming pool is located on the property of this wonderful health and relaxation centre. The motherland of Russian tea, where a well-known Northern Russian tea grows is situated just above “Shakhe” complex, and also loacted there is I.Koshmana's house – museum. In 1901 a peasant Judas Koshman brought seeds of tea to Sochi from Tchakhvi and planted them out in Solokh-aul. His plantation created a foundation for the most Northern tea in the world; a curative drink, which quenches thirst, gives energy and combats fatigue. The complex is connected by a picturesque pathway to I.Koshmana's house. The house features a museum where you can always try real green tea with well-known chestnut honey. 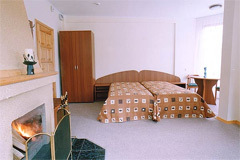 “Shakhe” complex is the first complex of such kind and of such level in Sochi . It is a small cottage town consisting of seven cottages, each of them is designed with four comfortable rooms with all conveniences, and total amount of 60 beds. The complex has its own equipment for electricity and water supply of the cottages, which makes it independent from the city networks and allows it to function autonomously. 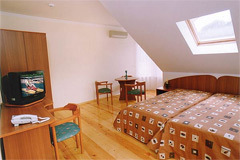 - a wide range of active rest - rafting, jeeping, fishing, excursions, hiking in the mountains. Children under 7 years old are not charged for accomodation. Payment info: cost according to the price list + 3% to cover currency exchange expenses.